Bugbrooke is a large village with shops and two public houses. Accommodation is also available in this village. A pleasant parkland area has been developed in this village and with its canal walk has many paths that can be used by disabled persons and families with young children. The route goes through the Church yard of St Michael's and along the delightful edge of the Millennium. Park. Turn left into Great Lane and continue ahead until you reach a footpath on your right which passes between houses with small wrought iron gates, continue along this path to arrive on the edge of a playing field. Keeping to the edge of the playing field walk straight ahead and then turn right on to a wide footpath and follow this down to an embankment that supports the Grand Union canal. Turn left along the embankment for a short distance to reach a gate that gives access to the canal path, now turn left on to the towpath. Keep on the towpath until you reach Anchor Farm approximately 1.5 miles. Leave the canal at Anchor Farm turning right over the canal and the railway and then join a path on your left. Walk up the hill passing through a gap in the hedge and eventually joining a path on top of the ridge. Take time to look back on your path as this is a good viewing point for the Nene Valley. 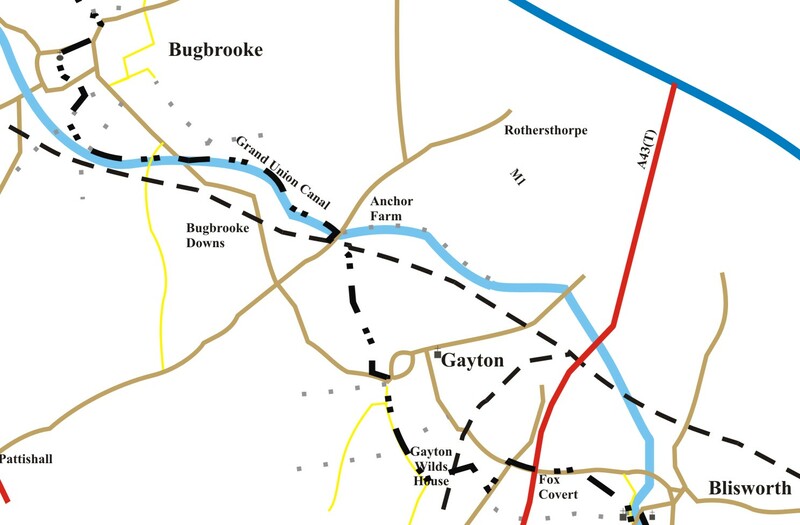 Enjoy this pleasant track leading into Gayton. Turn left at a crossing track on the edge of the village and continue along this path to arrive in the High Street of Gayton. The attractive village of Gayton sits on a ridge and has unrivalled views of the Nene Valley. You enter the village via Park Lane and walk up High Street, which has two Public Houses, to reach the village centre. Continue in a southerly direction crossing into Tiffield Road and follow this small road until you arrive at Gayton Wilds House. Turn left through the grounds and cross the dismantled railway track on a remaining bridge turning right, after a short distance, onto a track that emerges on a road. Turn left on the road and then right at the cross roads, continue ahead crossing the A43 road. Before reaching Hill Farm take footpath on your right, heading for a stile on the left of a small coppice. Continue in the same direction to reach another stile, by a metal farm gate, and access to the road into Blisworth. Turn right along this road passing a canal marina to arrive at a road bridge over the canal. The route does not visit the village centre but we would recommend you find time to explore the canal walks and back lanes of Blisworth. The village has a general provisions store and one Public House.